Someone posts on Facebook that Daniella is "actually a dude." appears on a washroom stall. Your friend is worried about transphobic comments made by teammates. Interested in Draw the Line Workshops in your school region? Click to sign up. 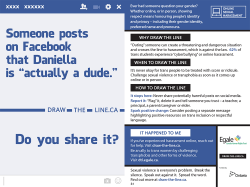 ‘Draw-the-Line’ is an interactive campaign that aims to engage Ontarians in dialogue about sexual violence. The campaign challenges common myths about sexual violence and equips bystanders with information on how to intervene safely and effectively. To end sexual violence in Ontario, we must not simply react, but prevent it. DTL ATV is part of Phase II of the Draw-the-Line campaign. 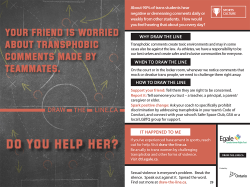 What is Draw-The-Line - Against Transphobic Violence? 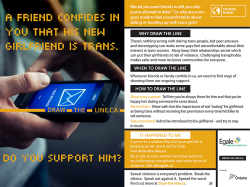 Draw-the-Line – Against Transphobic Violence (DTL ATV) is one element of the Draw-the-Line Campaign, a bystander focused, sexual violence prevention, public awareness campaign designed to provide information and provoke discussion around the existence of sexual violence in our communities, and strategies to intervene safely and effectively. DTL ATV is particularly focused on starting conversation around sexual and transphobic violence impacting trans women. It was designed in response to the trans community’s increased need for support, awareness, safety and allyship. While statistics paint a grim picture of the reality of many trans people’s daily lives in Canada, the stories of trans women’s survival and successes, often in the face of great adversity and minimal support, go largely unheard. An initial survey by the Trans Pulse Project (http://transpulseproject.ca/), the only trans-specific health project in Ontario, revealed a number of disturbing statistics showing 20% of trans Ontarians have been the targets of physical or sexual assaults. Of those who have ever experienced physical or sexual assault, 47% were more likely to have considered suicide, and 29% had actually attempted it in the year leading up to the study. As a microcosm of the larger society, schools are not immune to this violence. They reflect alarming realities for trans and gender creative children and youth. 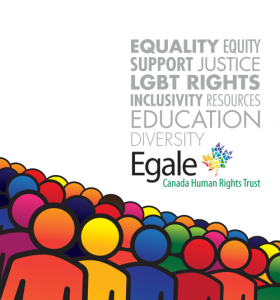 Egale Canada’s Every Class in Every School: Final Report on the First National Climate Survey on Homophobia, Biphobia, and Transphobia in Canadian Schools showed that almost three-quarters (74%) of trans youth surveyed had been verbally harassed about their gender expression. More than a third (37%) of trans youth had been physically harassed or assaulted due to their expressed gender. The report also revealed that 49% of trans youth reported having been sexually harassed in the past year (compared to 16.6% of female non-LGBTQ youth). Given the implications of this data on the health and safety of our children and youth, it’s important for schools and communities take proactive, preventative action to create safer, more inclusive environments for trans youth, particularly transwomen, and LGBTQ people more generally. Egale Canada believes these statistics only begin to outline the huge obstacles facing many trans individuals in their daily lives: obstacles like bullying, discrimination, verbal, physical and sexual assault and violence. Trans women and girls are often subject to the same potential for sexual violence as their cisgender counterparts, yet they also face the added stigma and challenges associated with simply being trans. While trans individuals and their stories are becoming more popular in media representations, these rarely do justice to the authentic realities faced by trans people. Instead media representations focus on an extreme and often offensive depiction of trans persons as sexual objects, sexual deviants, deserving victims, freaks of science, and worse. DTL ATV is designed to help fill the silence around the inclusion of trans women in our communities, encourage conversation around how bystanders can play a part in doing so, and decrease the rates of targeted discrimination of trans women. To provide information and opportunities for discussion amongst allies regarding the importance and impact of bystander intervention and the prevention of sexual and transphobic violence. 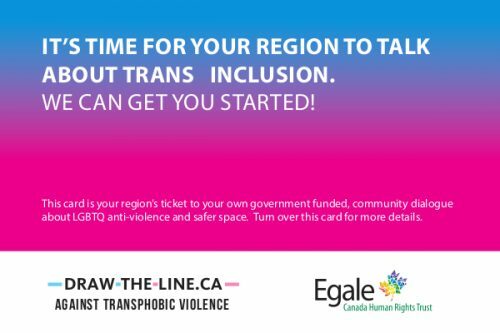 To provide opportunities and discussion for learning regarding trans identities, the inclusion of trans people in Canadian society, and the role of the individual in the creation of safer and more trans-inclusive communities. To encourage everyone to support trans communities and their allies in their work of creating safer and more inclusive communities for us all. The DTL-ATV was created as part of a multi-element public education campaign, meaning there are multiple campaign resources created to be most effective when used in conjunction with one another. 5 DTL – ATV Scenario Postcards and Posters – for use in the classroom and school. 2 DTL – ATV Videos (Hallway Harassment & Bathroom Panic) – for viewing and discussion in the classroom. 1 DTL – ATV Trans Women Speak Out Video – exploring first-hand accounts of trans women’s experiences with sexual and transphobic violence, and providing further information for educators regarding trans identities and the campaign as a whole. Background information and resources on trans identities and violence prevention. DTL – ATV Website – Check http://dtl.egale.ca for downloadable resources and links to community services for those that need support. In recalling an event where she was confronted by misogyny, trans-phobia, and racism all at once, Laverne Cox advocates for love and clarifies what makes a bully. We run a hotline staffed by transgender people for transgender people. Trans Lifeline volunteers are ready to respond to whatever support needs members of our community might have. 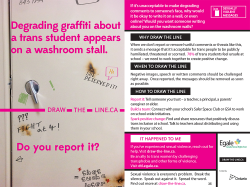 ‘Draw The Line’ is an interactive campaign that aims to engage Ontarians in a dialogue about sexual violence. Bullying is a major problem in our schools, workplaces, homes, and over the Internet. Over the month of February, CKNW aims to raise awareness of these issues through various initiatives centered around our “Pink Shirt Day” campaign. The GLSEN Day of Silence is a student-led national event that brings attention to anti-LGBT name-calling, bullying and harassment in schools. Day of Pink is a day where communities across the country, and across the world, can unite in celebrating diversity and raising awareness to stop homophobia, transphobia, transmisogyny, and all forms of bullying. Ontario recognizes this month is a time to raise awareness about the devastating impact of sexual assault and focus on the measures being taken to stop violence and support survivors. The International Day Against Homophobia and Transphobia (IDAHOT), held on May 17 every year, is a rallying event offering an opportunity for people to get together and reach out to one another. In Canada, Fondation Émergence promotes the International Day Against Homophobia and Transphobia and encourages organisations and individuals to highlight this event in their environment. Ally Week is a national dialogue about how everyone can work to become better allies to LGBT youth. We know that allyship is about more than broadly supporting LGBTQ people; it’s an active, ongoing process of advocating for LGBTQ youth (and other marginalized groups) without speaking for them or over them. During #AllyWeek, we challenge one another to think critically about what allyship means, how we are allies to others, and what kind of allies we seek out for ourselves. Spirit Day began in 2010 as a way to show support for LGBTQ youth and take a stand against bullying. Following a string of high-profile suicide deaths of gay teens in 2010, GLAAD worked to involve millions of teachers, workplaces, celebrities, media outlets and students in going purple on social media or wearing purple, a color that symbolizes spirit on the rainbow flag. Spirit Day now occurs every year on the third Thursday in October, during National Bullying Prevention Month, and has become the most visible day of support for LGBTQ youth. Your friend is worried about transphobic comments made by teammates. Do you help her? A friend confides in you that his new girlfriend is trans. Do you support him? Degrading graffiti about a trans student appears on a washroom stall. Do you report it? Someone posts on Facebook that Daniella is “actually a dude.” Do you share it? If you or someone you know has faced sexual violence click 'Get Help Now' for support and information.